Ozone layer damage is yet another known consequence of geoengineering the atmosphere (causing extremely dangerous UV radiation exposure). Other recent studies now note a “shrinking atmosphere” which is very possibly also linked to the ongoing geoengineering programs. The “hydrological cycle” of the planet is being completely disrupted by the geoengineering aerosol saturation of the atmosphere. How might such precipitation control benefit the power structure? Fungal proliferation is yet another inevitable crisis when the atmosphere is filled with particulates, soils are contaminated with the geoengineering fallout, and waters are polluted with the same. Already, countless species are feeling the effects. The current “species extinction rate” should be absolutely shocking to all. At the present time the “extinction rate is 10,000 times “natural variability”. This is 1,000,000% of “normal background rates”. Though main stream media would never discuss this, we are currently in the sixth mass extinction on planet Earth. Is geoengineering responsible for all of this? 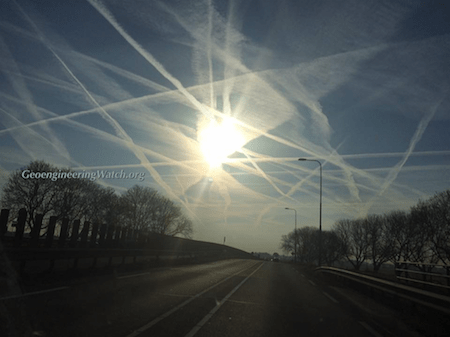 Of course not all, but if the available science and data is considered, geoengineering is mathematically by far the single most significant cause of environmental and climate devastation on the planet today. If all available information is considered, geoengineering is the greatest and most immediate threat to all life on Earth short of nuclear catastrophe. 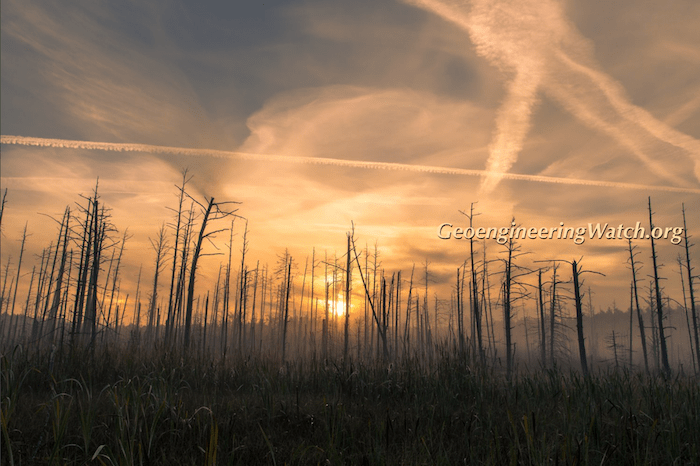 Drought, deluge, and hazy toxic skies, welcome to geoengineering. Though rain and snow is falling in areas of North America, at times in a deluge or “blizzard” depending on the season, the droughts in the continental US ( and many other regions around the globe), are getting worse overall. There are now often massive areas of drifting cloud cover spanning thousands of miles over land masses and oceans with little or no precipitation. Why is this? Why are the skies so often completely featureless as these expansive cloud banks and upper level “haze” drift across the globe? If individual clouds can be recognized in these “drifting masses”, they often appear “melted into” the upper story of geoengineering “haze”. Horizon to horizon geoengineering trails are not the only sign of spraying. Clouds should be “white” and the sky “blue”. Wispy, dingy, cob web like upper level “clouds” are are not natural and are another hallmark of spraying, as are “silvery white” skies. Atmospheric aerosol saturation greatly effects wind patterns and diminishes precipitation overall which in turn further fuels droughts of unprecedented scope and scale. The disruption in the hydrological cycle can also cause record rainfall as rain which was kept from falling in one location migrates elsewhere to come down in a deluge. The conditions described above are known consequences of stratospheric aerosol geoengineering (SAG) and solar radiation management (SRM) . All available science data confirms the effect of geoengineering particulates on rainfall. Though main stream science sources are still not willing to openly admit to the fact that geoengineering programs have been fully deployed for decades, a growing mountain of evidence makes this fact indisputable. Again, the ongoing stratospheric geoengineering programs are greatly reducing overall rainfall ( as mentioned) and all but eliminating deep blue skies. This effect is known as “global dimming“. Blocking the sun with reflective geoengineering aerosols reduces evaporation. Wind is reduced significantly in many cases from atmospheric aerosol saturation as the particles scatter solar energy and thus reduce convection from the ground that would otherwise occur from daytime heating. The slowing of the wind reduces evaporation even more. Further, precipitation cells that do form are often dispersed and diminished from the excessive amount of geoengineering particulates. This causes too many “condensation nuclei” and the droplets do not combine and fall as rain but migrate on. When the planets natural weather is suppressed or altered by climate engineering, energy builds up in the biosphere. This contributes to fuel catastrophic storms which will continue to increase along with catastrophic drought. There is a mountain of scientific data to confirm the reality of “global dimming‘. Most have never even heard the term much less noticed the effect over recent decades. Though articles from mainstream publications admit to the “global dimming” issue, most understate the percentage of dimming and all point the finger at “pollution particulates” as the sole cause. Countless jet aircraft which crisscross our skies daily, dispersing millions of tons of toxic metal and chemical particulates, are completely ignored by all main stream media journalists and sources. To date main stream media has done its best to avoid even mentioning the subject of geoengineering much less admitting to these ongoing programs of total planetary devastation. The overall ramifications from global dimming and geoengineering cannot be accurately quantified. 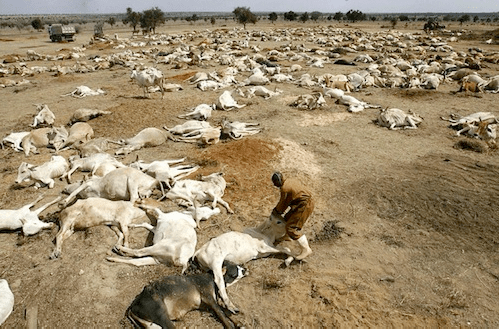 Loss of photo synthesis, destruction of the ozone layer, reduction in global rainfall, loss of blue sky, toxification of soils and waters, these are only a few of the known consequences of the global atmospheric spraying. What does this imply? As already documented above, saturating the atmosphere with particulates shreds the protective layers of the atmosphere, namely the ozone layer. Particulate saturation in the upper atmosphere causes a chemical reaction which does the damage. There is now a massive Northern hemisphere ozone hole in addition to the Southern Hemisphere hole we have all heard about for decades. Stratospheric aerosol geoengineering is in all likelihood the primary cause of the global ozone depletion, not just “CFC’s” as we have been told. Again, this has already been cited above and can be easily researched. Search “geoengineering is destroying the ozone layer”. All available science makes this point clear. Without the ozone layer, life in any form would likely not exist on our planet. There is yet one more issue related to the destruction of our natural protection from the sun’s usual radiation output: protection from solar flares. Coronal mass ejections or “CME’s” can and will do horrific damage to our planet and most especially human infrastructure. If electricity grids are shut down due to a strong CME, the potential dangers are sobering indeed. With no grid power to cool nuclear power facilities for an extended time, we could face Fukushima x 100, or 200, or? Without cooling, meltdowns would eventually occur. Just one major nuclear catastrophe could exterminate life on the planet, let alone dozens or hundreds of them. Geoengineering is destroying our natural protection from such an event caused by a strong coronal mass ejection. Climate engineering is radically altering upper and lower level wind currents which in turn trigger ocean current changes. Most are completely unaware of the wind and ocean current disruptions occurring around the globe. Even fewer are aware of the ramifications which are already unfolding from these changes. Ocean current changes are already delivering warmer waters to regions with vast undersea methane deposits. These deposits are known as “methane hydrate” deposits and literally hold life on earth in the balance. 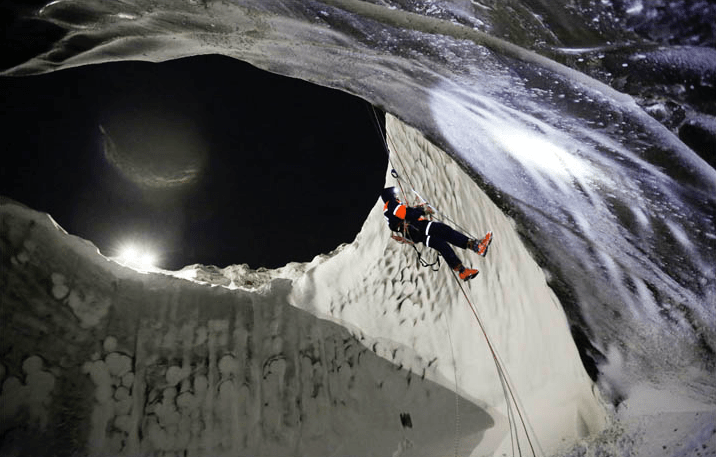 Many regions around the globe are beginning to expel methane from hydrate and clathrate deposits. The East Siberian Shelf of the Arctic is already releasing en masse. All available data indicates that this event alone is changing our biosphere by the day. 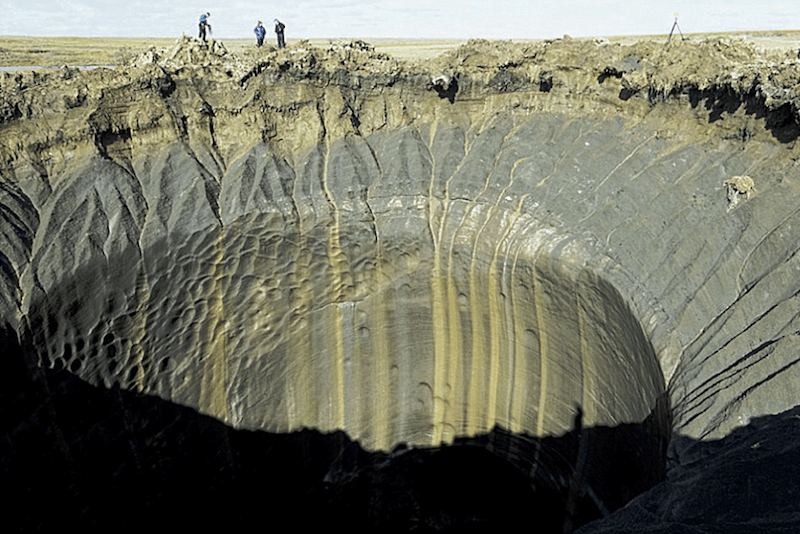 Though groups of scientists like the “Arctic Methane Emergency Group” (AMEG) are calling for “emergency wartime scale geoengineering to avert planetary catastrophe”, available data indicates that the very geoengineering programs (that AMEG is selling as a cure for the unfolding climate collapse), are more likely a major causal factor in triggering the methane catastrophe in the first place. The fully deployed planetary geoengineering programs have been altering wind and rain patterns at an ever increasing level for decades. Again, it is these alterations that have likely been a major factor in the triggering of mass methane release. Saturation of the atmosphere with methane is equivalent to covering the planet with a sheet of glass. The sun’s thermal energy gets in, but does not get out. Though most articles on methane release state methane to be 20 times more potent a greenhouse gas than Co2, this is over a 100 year time horizon. Over a ten year time horizon, methane is at least 100 times more potent. In addition to the atmospheric damage caused by the methane release, there is also ocean acidification. 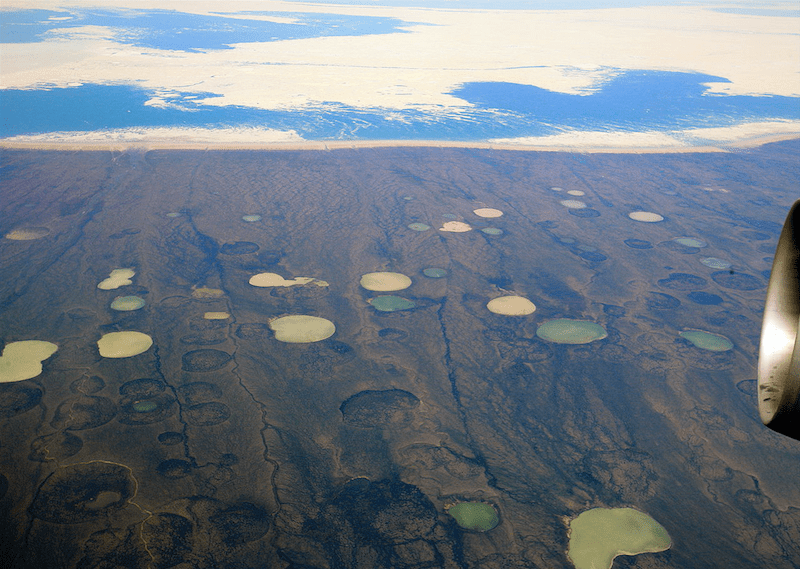 As the methane migrates from the sea floor to the surface, much is dissolved into the water (methane is also thawing in Arctic tundra and exploding into the atmosphere). Oceans are currently acidifying (and dying) at an extremely alarming rate. Again, the consequences of methane release alone threatens all life on Earth in the very near term. The global geoengineering/weather modification/chemtrail programs have likely been going on for over seven decades. Recently found documents from the NASA archives indicate that these programs already had budgets into the hundreds of millions of dollars even by the mid 1960’s (extensive senate documents have also been found and posted). These already massive climate altering programs were radically ramped up in the last 15 years. Though most of us alive today have perhaps known little truly “natural” weather, what we are experiencing today is anything but natural. The climate now “swings” radically from one extreme to another. It is now common to have spring like temperatures one day and snow (likely artificially nucleated) the next. These “swings” or “fluctuations” are getting ever more severe. Geoengineered “weather whiplash” scenarios are now the norm. Is this really possible? Available science as well as observed weather events and jet stream “anomalies” say absolutely yes. HAARP is the acronym for a massively powerful “ionosphere heater” facility located in Alaska. This is a huge and extremely powerful antenna array which is capable of transmitting as much as three million watts of power into the ionosphere. This triggers an electrical chain reaction which then causes a ‘bulge” in the atmosphere, which in turn can alter the course of the jet stream. Such alterations can in turn “steer” weather systems. By such manipulation, storm fronts can be combined and worsened into “frankenstorms“, or broken apart and dispersed. There are thought to be nearly 100 large ground based “ionosphere heaters” around the globe, some held by China and Russia. It has also become evident in recent years that “weather warfare” is already a lethal global reality. The potential of these frequency transmitter facilities is enhanced by the spraying of our skies. The saturation of the atmosphere with metal particulates makes the atmosphere more “conductive”. This in turn increases the capabilities of the ionosphere heaters. An atmosphere that is more conductive from metal particulate saturation can produce more frequent lightning. These same particulates also have the net effect of “diminishing and dispersing” rain. Forests around the globe are now filled with dead and dying trees (referenced later in this article). In addition, the foliage of trees are now covered with what amounts to an “incendiary” dust from the geoengineering particulates. Add the shredded ozone layer which creates more heat, and the “weather modified” conditions are even worse. The obvious result is more frequent and catastrophic forest fires. This phenomenon is being played out around the globe. Summer of 2012 saw the Northern Hemisphere burning down and now it is Australia and Tasmania in meltdown (global forest fire incineration is accelerating). Yet another seemingly impossible aspect of global weather modification is geoengineered snow storms. Many will write this one off as impossible without any investigation. That is a mistake as the science of chemical ice nucleation for weather modification is very established and has long since been commonly practiced in many countries, though it is hard to comprehend this process being done on such a massive scale. There are several patents on “artificial ice nucleation for weather modification”, including one from NASA. Artificially nucleated storms appear to be carried out under a myriad of conditions. In many cases, storms that should have yielded only rain, can be artificially nucleated to “change over” to snow. The term “change over” has recently been coined by The Weather Channel and other corporate/military/industrial complex weather agencies. A geoengineered snow event is generally called “heavy wet snow” (another recent term). This “snow” can begin to fall at temperatures far above freezing though the ongoing chemical process eventually cools the surrounding air mass. The resulting “snow” and “ice” can sometimes remain a surprisingly long time in spite of warmer temperatures, a result of artificial chemical nucleation. This aspect of weather modification is covered in the following article, “Geoengineered Snow Storms Wreaking Havoc Around the Globe”. This is the net result of geoengineering. Nature does not give something for nothing. This should seem all too obvious, but unfortunately the “scientists” in so many cases are completely blind to the consequences of their experiments. In the case of cloud seeding to produce rain, if they succeed, then that moisture will not end up where it would have otherwise gone. In the case of saturation spraying that is known to diminish rain by scattering it into massive artificial cloud cover and haze, where will all that moisture end up? Coming down somewhere else in a deluge? Is this perhaps why the US west is locked in record drought and US east is having record rains? The cooling effects of geoengineering come at the cost of a much worsened overall warming of the planet. Even NASA admits the “condensation trails” (geoengineering particulate trails) are warming the planet. 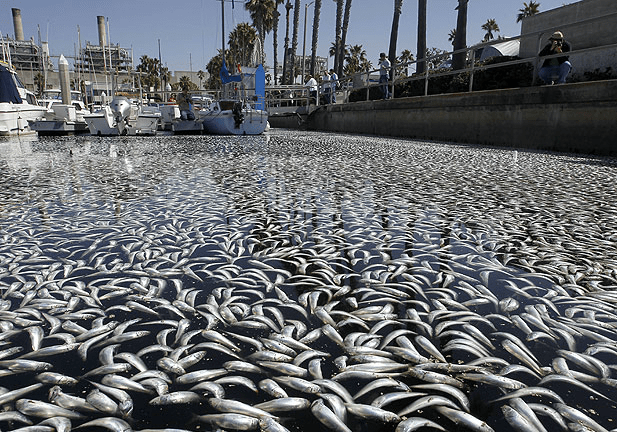 “Dead fish float in the King Harbour area of Redondo Beach, south of Los Angeles. 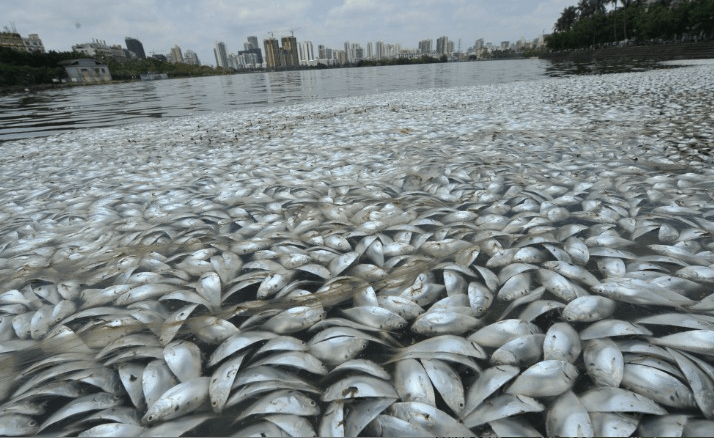 An estimated million fish turned up dead in the marina, “puzzling” authorities and triggering a massive cleanup effort”. Inhalation of microscopic particulates is highly damaging no matter what the particulate material, the metallic particles in question are especially lethal. Respiratory ailments and mortalities are now literally epidemic. Degenerative human diseases that are linked to heavy metal exposure are now going virtually off the charts. ADD, Alzheimer’s, Autism, ALL, immune disfunction, and many other diseases associated with heavy metals, have all skyrocketed in recent years. According to scientists like internationally know neuroscientist Russell Blaylock, the heavy metal nano particles are so small that they pass right through the lung lining into the blood stream. There they can adhere to cell receptors like a plaque, slowly but surely shutting down bodily functions and the immune system. These metals are all but impossible to remove once they have become lodged in the body. In addition, virtually every bite we eat is now contaminated with these toxic nano particles as they are absorbed by plant life, which is highly damaging to crops. Stratospheric aerosol geoengineering (AKA solar radiation management) has now tainted all. Every breath we take, every bite we eat, all is contaminated. A mountain of data, studies, and testing confirms this conclusion beyond reasonable doubt. We are all quite literally under assault. The threat to all life on earth from the global weather modification programs cannot be overstated. It is up to all of us to help in the task of bringing these programs to light, and to a halt so the planet can begin to recover. Arm yourself with copies of credible articles, data, and DVD copies to help spread the word on this most dire issue. It is likely the vast majority of military and private sector people involved with geoengineering do not understand the consequences of what they are involved in. Time is not on our side. Every day global geoengineering continues, our odds are diminished. We must all pull together in the effort to shine the light on this greatest of all human crimes. Once the geoengineering issue is truly out in the open, and those who physically carry out the spraying realize what they are a part of, we have a chance to stop these lethal programs. Reaching a critical mass of public awareness is the only way forward. May be freely reprinted, so long as the text is unaltered, all hyperlinks are left intact, and credit for the article is prominently given to GeoengineeringWatch.organd the article’s author with a hyperlink back to the original story. I do not have the expertise and knowledge you have. Because I see it in the skies above me. I cannot forget the day I was sitting with my mother on her back deck on a beautiful clear day, yes a clear day without trails. I watched it as it dispersed over the city. I also read a report, not having to do with this incident, that when these spraying’s occur, there is an increase in crime. I do not know if that is true. Also, a gentleman in the nearby county had the grass in his yard tested and found the overly abundant presence of Aluminum particles and some other metals and this was poste don Steve Quayles web site about 5 years ago. I have read the postings regarding weather warfare and how in the 60’s Cuba accused The U.S. of seeding the clouds so that the rains would not come to their crops. I also believe that some of the extreme climate issues that have occur in this country is from weather warfare, a secret but a publicly visible war that is occurring. I’ve never felt the tension from people in my life. We are on the edge of a major implosion that is going to be a catastrophe world wide event. It seems the entire world is falling into chaos in all areas of humanity. These events will catch millions unaware because they don’t care, don’t want to hear bad news or anything that upsets their day lives ,too involved with themselves, too entertained and many will perish. Is it possible we have already crossed the point of no return? Very well stated! Can’t wait for fungus on our gardens to appear. Please do some research on the Grand Solar Minimum as a possible explanation for the climate changes we’re experiencing. To anonymous I simply say…look up and perhaps you will wise up.